Things are getting pretty heated up in Serangoon North Avenue 1 as renowned property developers Keppel Land and Wing Tai Holdings have joined forces to put up a top bid of $446.28 million or $964.81 psf ppr, for a private residential site in the area – with 15 other property developers involved in the tender. The tender was concluded just one day after Oxley Holdings-led consortium completed an en bloc sale for nearby Serangoon Ville for $499 million or $835 psf ppr, which makes the bid from Keppel Land (KepLand) and Wing Tai almost 16% higher for the GLS site at Serangoon North Avenue 1. The state tender saw some of biggest developers in Singapore taking part, with the likes of Fraser Centrepoint Ltd (who was the 2nd highest bidder with $418.7 million or $905.19 psf ppr), a joint-venture between SingLand and UOL (coming in 3rd place with $417.2 million or $901.93 psf ppr) and City Developments Ltd (4th placed with $416.89 million or $901.26 psf ppr). According to KepLand, the plan is to develop more than 600 homes on the Serangoon North Avenue 1 site, and are confident that the future new launch condo project will see healthy demand as there haven’t been many new condominiums being launched for the last couple of years within the popular Serangoon Garden precinct. It was noted that KepLand and Wing Tai have already teamed up earlier this year to submit a bid for a private residential site at Woodleigh Lane, just to be edged out by a narrow 0.8% margin – from the top bid submitted by a joint-venture between Chip Eng Seng together with Heeton Holdings and KSH. Based on estimates, property consultants believed that KepLand and Wing Tai would have to price their new launch condo at Serangoon North Avenue 1 at more than $1,600 psf on average – significantly much higher than the other recent private residential projects launched within the same area. 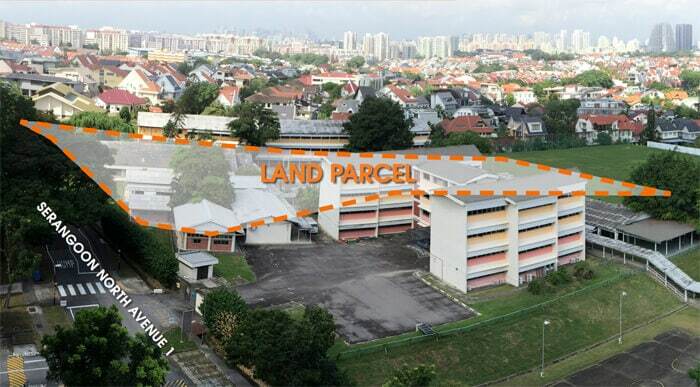 They have added that the situation now may be steering towards a recovery path for the property market after recent land tenders have fetched more than $1,000 psf ppr this year – namely the GLS sites at Stirling Road and Woodleigh Lane. In October 2016, City Developments Ltd (CDL) launched Forest Woods condo (which is significantly closer to Serangoon MRT Station and the NEX shopping mall, as compared to the Serangoon North Avenue 1 site) at a median psf price of $1,400 and they sold 337 units out of the 519 in total on its first weekend of sales. Market watchers have also mentioned that the URA site at Serangoon North Avenue 1 has drawn more interest than the collective sale of Serangoon Ville – 16 versus 5. When being compared head-to-head, the Serangoon Ville site has a higher plot ratio, which translates to a larger GFA (gross floor area) of 831,349 sq ft as compared to the URA site’s 462,557 sq ft, which will apparently have a higher risk due to the bigger deal size. It is also partly due to the fact that developers looking at a lower investment quantum and the process of redevelopment would be easier on the URA site as compared to an en bloc deal as it will still be subjected to mediation or court approval and also other miscellaneous processes.